Well it’s only been nine months since we returned to the UK so it’s about time we finally got around to completing the expenses and itinerary. Actually, Megan completed them months ago but I’ve only just got around to finishing off the blog. There’s no excuse I can give as to why it’s taken so long… well… no excuse that you would believe anyway. We simply got back into the day to day routine of things and I just never got around to it, poor show I know. To be honest I had been putting it off; just thinking about the trip was a bit upsetting and looking back made us realise just how quickly it all went and how much we miss travelling, living in a tent and eating tuna pasta…..ok not so much the last one. We got back in August and within a month had rented a house, been to Ikea (even signed up for the family card, free coffee for us) and started working again. Me back bobbing on the Irish Sea, Megan teaching youths the joys of history. It’s scary just how quickly normality can settle in, and instead of dodging leeches and watching for crocs we were spending Saturday nights in Sainsburys (it’s the best time to shop, it’s so quiet) and evenings discussing whether half nine was too early to go to bed, since nothing was on the telly. Of course it was great to see family and friends, but as the days turned into weeks the initial excitement of being home left us and we started working out how much money we could get together in the next two months in order to head off again once the Land Rover returned. But the Land Rover didn’t return until much, much later: it was put on a ship to Europe from Australia but somehow ended up on the east coast of the USA. A few rather worried emails later saw it heading home and we started sorting out the money to pay the bill. The original quote was for around £3000 so when a bill for £8000 was presented it was a slight shock (massive understatement by the way, proper sailor swear words were used in the presence of polite company.) With no money to pay the bill and my kidney on ebay not reaching its reserve price we had a slight issue. Why had it gone up by £5000? Well it seems that in the original bill of lading, which is the legal document that states who owns the car and its size, the car had grown from 20m3 to a whopping 33m3 . An easy fix I thought, it’s clearly a typo so I’ll just ring Australia and tell them, they’ll let the shipping company know and all will be right in the world. Of course it couldn’t be that easy, and to cut a very long story short the car was re-measured on its arrival into the UK and it would seem that although a mistake had been made my measuring was also a little on the optimistic side, so we had to shell out an extra £800. Doh! The lesson being always wait for, and double-check, your bill of lading!!!! It had never been a problem before with the other shipping companies so we’d left Australia without it. Never again. 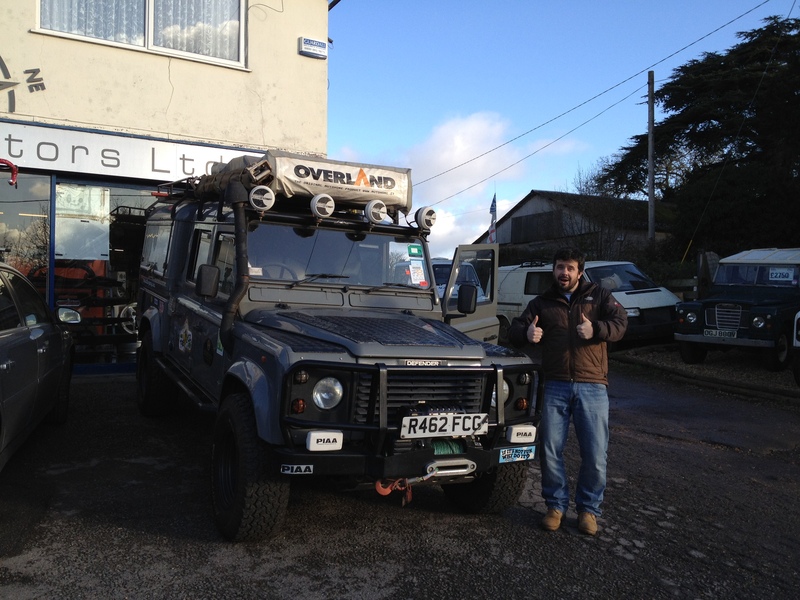 When the Landy finally cleared customs and my bank account was well and truly in the minus Marcus from Douglass Motors came and picked it up (started first time as always) and took it back to his workshop for a health test. Surprisingly ….no no, I mean naturally, it pretty much passed the MOT (just a few minor items to be replaced, bulbs etc…) We visited shortly after its return and although we had basically made up our minds to sell it I have to say there were a few pangs and almost a change of heart when we saw her sitting there, but with our sensible heads on we decided to put her up for sale. So Harriet has been all fixed up and is ready for someone else to have an adventure with her. See www.douglassmotors.co.uk if you are interested! We really miss the traveling and although we have been to Belgium and America since we have been back nothing beats jumping in your truck, praying it starts, and heading off into the unknown in a plume of smoke, all the while trying to guess where that squeak/rattle/smell is coming from. (Ahh, how I miss daily Land Rover ownership). We have been asked if we would do it again in a Land Rover, and although we realised after collecting all our gear from the car that we could actually have managed to fit all our stuff in the back of a Vauxhall Vectra Estate, we would always take a Land Rover. It was an adventure not knowing what would happen next but more than that we met a lot of people simply through our chosen means of transport. We stayed at people’s houses, took advantage of fellow Landy owners’ hospitality, and struck up long and fruitful conversations in garage forecourts, all prompted by the Land Rover. Anyone wishing to do a trip and not knowing which car to take, take a Land Rover, better, take mine! You will see from the expenses (that have been updated on the expenses page) that we spent around the £22,000 on the trip, and with the shipping and our flights it’s around the £33,400 mark. It’s a lot, and if you are careful can be done for a lot less. Fuel was the biggest expense, so maybe a smaller Land Rover would have brought the price down a tad. However, we started out with a target budget of £60 a day and the final figure was £64.8, which wasn’t too bad. Let’s be honest, if I was in charge of the budget we would currently be washing dishes in Turkey, trying to earn money for fuel, as I would have blown it all on beer in France. Megan takes full credit for managing the cash, and although at times I compared her to a well known Dickens character she was the main reason we had enough money to get around the world. Feet are starting to get itchy, and it’s not just the athletes foot playing up again because I put cream on it. 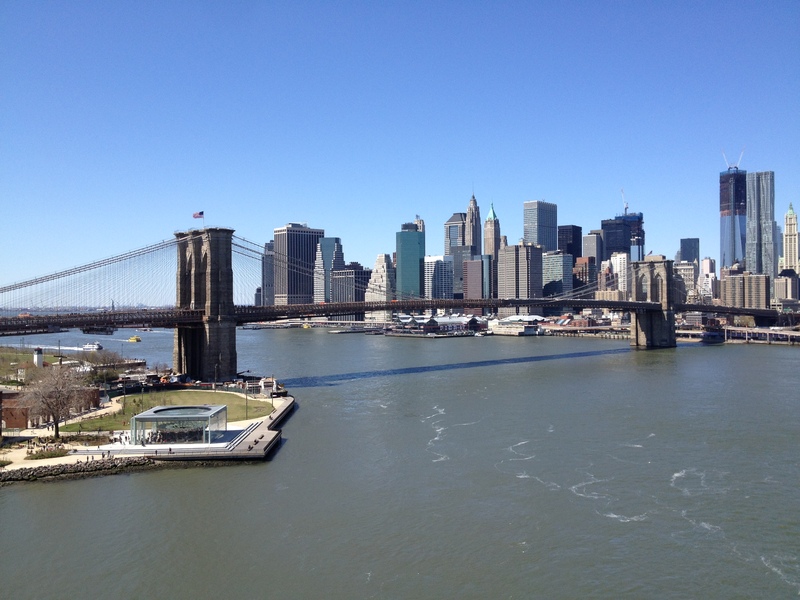 We have set ourselves May 2014 as the next trip date. Where to go is still up for discussion but Canada and North America seem to be the front runners for the time being. Money of course is the deciding factor but who needs food, money for rent and athletes foot cream when there is a new Land Rover to buy?! We would both like to once again thank all those who helped us on our trip. From friends and family, to garage owners and strangers who fed us and put us up in their houses (sorry about the silverware, only just found it in Megan’s case). If anyone is ever passing through London and wants an uncomfortable futon for a night or just a beer let me know! Chat to you all in 2014! Simon, I’ve been waiting for this final installment for so long and you didn’t disappoint! Your blog inspired us to write one for the 2011 Help for Heroes 4×4 European Rally and we will be doing the same in 2012. We leave on Saturday for 2 weeks of fun in our recently renovated Discovery 200 tdi so wish us luck and follow our progress by GPS at http://www.the-a-teamblog.com. Cheers and hope to bump into you again in the future. So .. this was the “I’ll give you a proper update in a couple of weeks” .. cough cough .. 6 months! Seriously thanks for posting this, really very interesting and great to get an update to how returning to “normal” life really is, back to earth with a bump eh! We’ve already been accused of having a “Car Park” by the neigbours, so as much as I’d like to add Harriet to the collection, I’m not so sure its going to happen in deepest darkest Kent! Glad your all back ok and that you’ve got something planned for 2014… you need to give us some proper info, if your after a recommendation I would highly recommend the algonquin national park, where I did a short trip in a boat, and a the surroundings are just beuatiful!!! PS .. I used to work in that office on the lhs, 55 Water Street!, its the S&P Building!! I was so excited to see that you were back in action Simon. 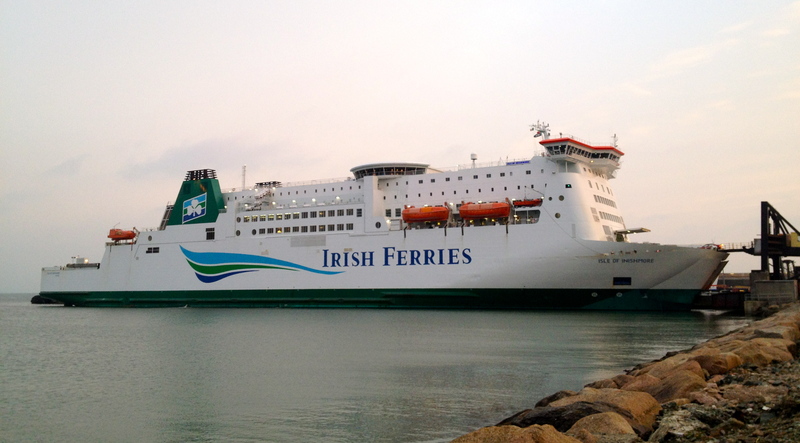 I know that the Irish Ferries is not quite the same as Harriet but I am sure that you could keep us just as entertained with a Ferry blog as you have with Trek to Oz.. This is just about the most useful blog ever. I’m planning my trip to Oz right now and the costings are a nightmare. It’s been really informative. I just stumbled across this blog some how, and I must say, I am glad I did! It’s fantastic! We spent 3-months travelling Europe in a 4×4 / camping (with 2x kids in tow, aged 2 and 3) and it was amazing. I’ll be adding this blog to RSS in case there are any future posts, or you do another trip in the future! if your coming to the overland show http://www.adventureoverlandshow.com pop in for a cupper we will be in the 101 camper….and if you fancy doing a talk in the sessions have a chat to tom mc hes the organ grinder…..